After all the great rains, everything is a lot greener, which means a lot of food around and therefore all the game has started giving birth. This is young mother with her calf, only a few days old and still wobbly on its feet. It is nice to see how well she is taking care of it. 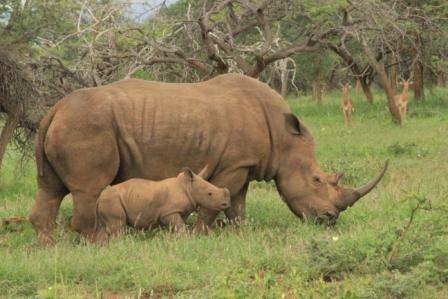 Rhinos have an amazing maternal bond with their offspring. They are very protective, which makes it very difficult for predators to catch any of the calves. This mother will protect her calf until it is about 2-3 years old, then it will have to fend for itself, for the mother would more than likely have another calf on the way, and it would be difficult for her to protect them both. It is possible that this calf might join another female who is calf less or another group of sub -adult rhinos, due to safety in numbers. When rhino calves are about 6.5-7 years old they are sexually mature, and the males especially will then try and find a mate of their own with which they can bread. Rhinos are not monogamous , as their gestation periods are very long, and it takes them a while to reach sexual maturity, so this means that one female can only give birth to one calf about ever 2-3 years, so a male rhino will have to impregnate as many females he can so the rhino population can grow. Rhino’s can Reach a dashing age or 30 years, and then they will still be able to give birth to 1 calf every two years, but rhino like any other animal also has one major enemy, man, unfortunately that is one to many.